To many of Wayne’s old time residents, the picture used with this week’s column will bring back nostalgic memories of the day when this was the only school building on the entire Radnor school grounds. The building stood on part of the site of the present high school, with the old Wayne Coffee House between it and the small structure which originally housed Wayne’s early fire engines. 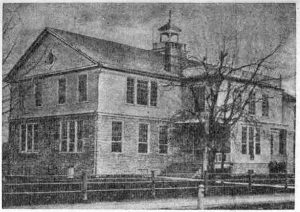 It was in this school building that the Wayne Methodist Episcopal Church held services while its own church edifice was being erected across the way, at the corner of Audubon and Runnymede avenues. The room which the church used was on the first floor at the front of the building. Upstairs was the Assembly Room, while the gymnasium was downstairs on the right, with classrooms on the left side. The bell on the roof was rung each morning to call the school children in to classes. After it was taken down, when the old school building was demolished, the bell was stored away in one of the other buildings, to be brought forth on the occasion of several Radnor football victories over Lower Merion. The day itself is described as “a perfect one… the church, with altar filled with potted plants, over which shafts of light streamed from the stained glass windows …as pretty a picture as could be presented.” Within the altar rail and on the platform were seated such dignitaries as Resident Bishop Cyrus D. Foss, Rev. George MacLaughlin, Rev. J. Hepburn Hargis, presiding elder; Dr. A.J. Kynett, secretary of the Board of Church Extension, and Rev. C.W. Straw, of Berwyn. Leonard E. Auty, well-known tenor from Philadelphia, was the soloist. Another musical feature was an original dedication hymn written for the occasion by Rev. James Morrow, secretary of the Pennsylvania Bible Society. An afternoon service beginning “promptly at three o’clock”, followed the interlude for dinner. And then there was still an evening service which was “largely attended and at which the interest of the day seemed to increase.” At the close of the sermon by Dr. Kynett, subscriptions of the day were resumed, under the direction of the apparently untiring Dr. Hargis. A final announcement reported a total of $6,005. And since the $6,500 asked for in the morning had included $500 estimated for completing the basement for social purposes, the trustees decided to postpone this part of the building program. And with the conclusion of the third and final service of that memorable June 28, 1891, the actual dedication of the new church took place, with Bishop Foss using the beautiful and impressive ceremony chosen for the service “after which the congregation dispersed, well satisfed with their Dedication Day.” And well they might have been.